She's grown accustomed to her brother, Peyton, being the focus of the family's attention and, lately, concern. Peyton is handsome and charismatic, but seems bent on self-destruction. Now, after a drunk-driving accident that crippled a boy, Peyton's serving some serious jail time, and Sydney is on her own, questioning her place in the family and the world. Then she meets the Chatham family. Drawn into their warm, chaotic circle, Sydney experiences unquestioning acceptance for the first time. There's effervescent Layla, who constantly falls for the wrong guy, Rosie, who's had her own fall from grace, and Mrs. Chatham, who even though ailing is the heart of the family. But it's with older brother Mac - quiet, watchful, and protective - that Sydney finally feels seen, really seen, at last. 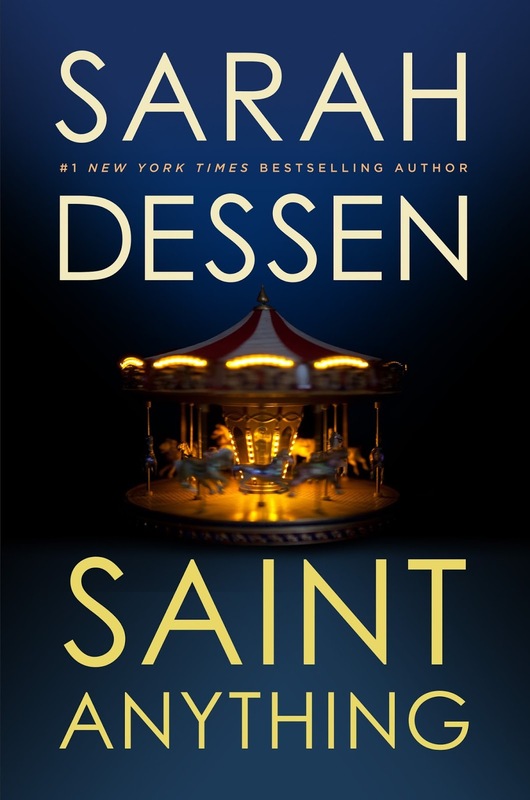 Saint Anything is Sarah Dessen's deepest and most psychologically probing novel yet, telling an engrossing story of a girl discovering friendship, love, and herself. 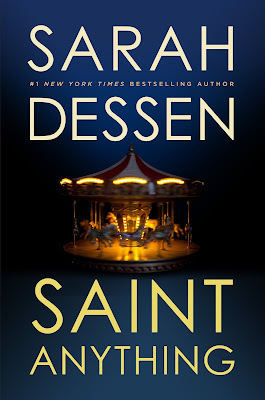 Saint Anything by Sarah Dessen had the potential of developing into something more than just a "good" story, but ultimately lacked the emotional power punch readers crave. The book was OK. Not wonderful, not good, but not bad either. It was a read deserving of three peaches out of the desired five. I've only read a handful of Sarah Dessen books to date, but I have discerned a distinctive "template" or "formula" to her writing, and I know other reviewers have said the same. It's as if Dessen wrote one bestseller and then based all of her following books on the same general outline. From book to book, Dessen only slightly tweaks the character names, the setting, and gifts upon her main character a new problem to overcome. Oh, and of course, the change of title. However, from there, it's all the mundane same: girl meets boy, befriends boy, falls in love with boy, boy helps girl to overcome her problem, yay! They live happily ever after. This is not to say Dessen's writing is bad. I would certainly not agree with that statement. Much to the contrary, I believe her writing to be quite good. It's just not different. Or exciting. Or all that interesting. I've seen it before. On a more positive note, I did enjoy the characters in this story. Main character, Sydney, felt very much real to me in the pages. I could relate to a number of her problems, and for the most part - understood her. However, it was the personality-filled supporting characters, such as Layla Chatham, who brought color into the narrative. Layla, Sydney's newfound best friend, possessed quite lovable quirks to her character. An example? Layla's extremely memorable, very selective, and highly methodical approach to the consumption of the common french fry. Dessen, by including details as this, definitely won over some brownie points in her favor. I'm sorry to say, however, Sydney's love interest in the story, Mac, sort of fell flat for me. He was supportive, kind, caring, friendly, blah, blah, etc.. But he lacked that swoon factor. From page one until the very end, he remained a friend in my eyes. Perhaps this is simply because Dessen wanted to focus more on Sydney's family problems rather than the romance, but I say if you do something, do it well. There's no point in adding a love interest if said love interest can simply better off remain as a friend. All in all, Saint Anything was not quite the memorable, emotional, impactful read I was looking for. The book started off on a high note, but continually regressed as the pages turned. I found some portions rather monotonous and dull, while others I found to stand out and shine. And although this wasn't my favorite Dessen read, it may perhaps be yours. Thanks for the comment, Tiffany! Yeah, it wasn't my favorite Sarah Dessen read, but I enjoyed it nonetheless. Hope you give one of her books a try. This was my first Sarah Dessen and I really enjoyed it, but I totally understand where your coming from with the Mac thing. Plus, I agree with the lack of an emotional impact, I was expecting to be touched or moved or something but I really wasn't. Hey, Sam, thanks for visiting the blog! Yeah - although I liked the book, it just wasn't a favorite of mine. I was just expecting more after hearing so many rave reviews. I'm glad to hear you enjoyed it!